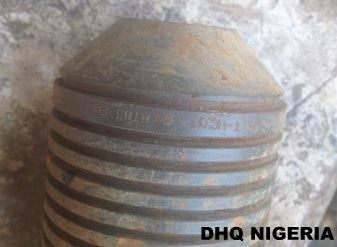 “The Defence Headquarters (DHQ) wishes to inform Nigerians living in the North East and any other parts of the country to keep a lookout for Cluster Bombs sometimes called scatter bombs as the Nigerian Army Engineers serving in Adamawa State have recovered some catches of these bombs in the contested areas in recent time. 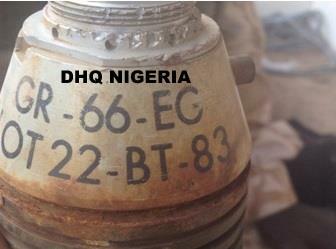 The military high command has discovered that the Boko Haram Terrorists (BHT) in the areas have used such lethal instruments over time to push their callous terrorist cause. For easy identification, it is important to note that cluster bombs are bombs that house submunitions, that is, smaller explosives contained in individual cases. These bombs are used against large areas containing many targets, such as columns of vehicles, marketplaces, places of worship or large troop concentration as the case may be. Some cluster bombs carry several hundred of very small explosives wrapped in a metal container like a pot while others carry larger submunitions that can find specific targets such as tanks. Some of these submunitions do not blow up immediately, but remain behind and act as landmines. 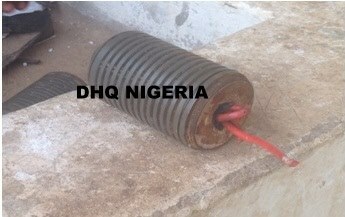 This can be an acceptable explanation for the recovery of catches of these bombs by Nigerian Army Engineers in the area. The general publics are hereby requested to be wary of such concealed dangerous equipment now being used by the terrorist elements to cause havoc to both innocent lives and property. 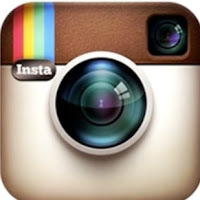 The public is also advised to report such objects/materials if seen to security agencies for prompt action. The terrorists are desperate and frustrated and could use any cruel instrument to actualize their evil intention. LET EVERYBODY ANSWER HIS FATHER’S NAME. TO YOUR TENTS O ISRAEL! The solution to bokoharam is for u Nigerians to go ur seperate ways, DIVIDE INTO 3 gbam. I agree with u, let them go their seperate ways,naija into 3-4 parts,Biafra,Oduwa,Middlebelt that christian north country and far north boko republic ,what every they wont and every normal country break out of naija close ur border,no visa. The best advise I will give u guyz is to carry out house to house search in all the northern state. Believe me the worst is yet to happen. Boko haram are now living among other innocent citizens in the cities! Secondly the government should employ the service of community policing, they will be of great help bicus they know those terrorist.